Kids Still Plagued By Obesity In U.S., Report Finds : Shots - Health News The childhood obesity epidemic rages on in the United States, with a big surge among the youngest kids, according to the latest government data. Despite a push in recent years for healthier snacks and more exercise for U.S. kids, the prevalence of obesity is still too high, pediatricians say. "The main take-home message for me is that, clearly, obesity remains a problem," says Asheley Skinner, an associate professor of population health services at Duke University and leader of the analysis. "It's not improving." Childhood obesity rates have been rising for decades, sparking widespread alarm among public health researchers and officials. Obese children tend to become obese adults, who are prone to many health problems, including cancer, heart disease and Type 2 diabetes. But hopes rose several years ago that the epidemic might be ebbing, at least in some parts of the country. Some researchers suggested efforts such as Michelle's Obama's Let's Move campaign might be working. Unfortunately, that doesn't appear to be the case, Skinner and her colleagues discovered when they analyzed the latest national data from the federal Centers for Disease Control and Prevention's National Health and Nutrition Examination Survey. 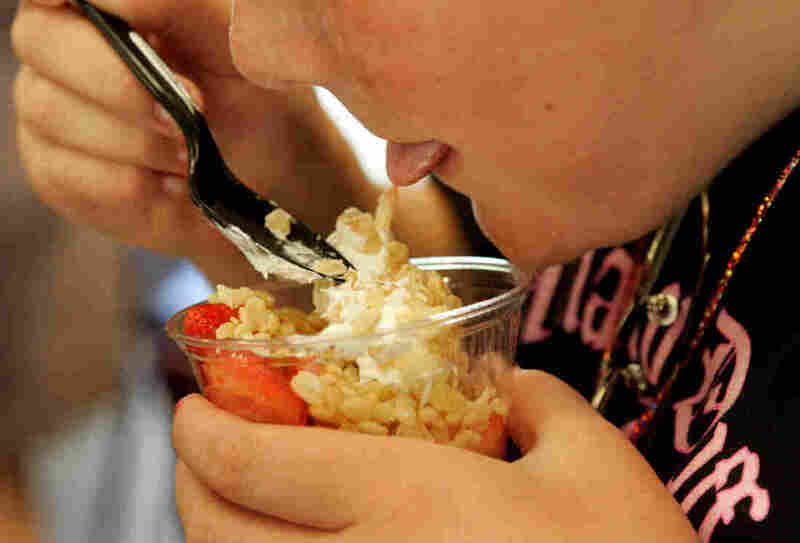 The NHANES survey is one of the federal government's main measures of childhood obesity. Moreover, there was no statistical difference in the overall obesity rate between the 2013-2014 and 2015-2016 surveys — undercutting hopes that obesity had begun to decline in recent years. "It is a big jump," Skinner says. "That's the highest level of obesity that we've seen in 2- to 5-year-olds since 1999." The increase more than makes up for any decrease that may have occurred in the previous survey, Skinner says. "Obesity in the youngest group is a concern," she says, "because when obesity starts younger, most of these children continue to have obesity throughout childhood and into adulthood. "The earlier you start seeing this, the harder it is to address it for these kids." "We have known about this epidemic of childhood obesity — and have been pouring research dollars and public health dollars into this problem — for at least 20 years," says Dr. Sarah Armstrong, an associate professor of pediatrics at Duke who helped conduct the analysis. "And despite that, we don't seem to be making a big dent in the situation." "We need to double down our efforts and find out what's going to work," she says, "or the health of our future generation is really in jeopardy." In an editorial accompanying the study, Dr. David Ludwig of Boston Children's Hospital calls for a more comprehensive national strategy for fighting the problem. "We haven't generated a truly systematic or comprehensive approach across society that addresses all drivers of childhood obesity — poor diet, a lack of physical activity and a healthy food supply that will encourage everyone to eat well," Ludwig says. "We need a truly national, comprehensive strategy to tackle this epidemic." Hispanic and African-American children continue to be much more likely to become obese than white children, the analysis shows. Melinda Sothern, director of behavioral and community health sciences at Louisiana State University, suggests that trend may be the result of a "perfect storm" of stress, which, when combined with a "lack of access to healthy foods and opportunities for outdoor play," can affect biology on a genetic level.